visit!). Best of all, our proven Less Mess = Less Stress ™ process takes less time than you think. For over 10 years we’ve helped hundreds of New Yorkers tackle a wide variety of home organization projects. We’ve seen it all. We work with you on-site in your home, leading the process every step of the way. Whether you have a shoe-box sized studio or a large home, we’ll you make the best use of your space and create simple systems so you can easily access the things you need. • Clearing clutter: De-clutter your home and create more space. If you have trouble letting things go, we’ll ease you through the process. • General home organization systems: Maximize your space and stop wasting time looking for things you know you have … somewhere. We create smart storage solutions for your stuff, from your keys to your tax returns. • Closet organization and design: Get dressed with less stress and maximize your space. No more “scary closets”. (We hear that term a lot!) We can make the best possible use of your existing space or re-design your closets for optimal efficiency. 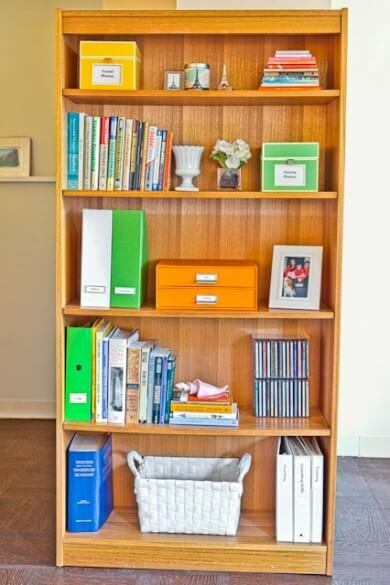 • Home office organization: You can work productively no matter how small your place is. We’ll create a workspace that works for you. • Kids’ rooms: From infants to teenagers, we’ll set up systems to deal with your kids’ stuff. We’ll help older kids create systems they can maintain themselves. Really. • Kitchen organization: Set up your kitchen so that cooking is a pleasure, not a chore. Use your space most efficiently. No more avalanches of pot lids and plastic containers. • Storage unit organization: Cut your storage costs by organizing – or eliminating – your outside storage unit. Reclaim your basement, garage or attic. If you’re spending more than $100 per month on storage or haven’t seen your stuff in over a year contact us right now! We’ll quickly help you sort through a backlog of information and develop streamlined systems so you can stay on top of important info. • Paper management and filing systems: We’ll create effective systems so you can manage the mail and easily find and store the information you need. Eliminate late fees and penalties – and reduce stress. • Paper purge: We’ll quickly clear out piles of papers and information. We know what you need to save, shred and toss. Let go of old papers without fear that you might need them some day. • Organize electronic documents and information: The information you need can truly be a click away, right at your fingertips. Go paper-less, if not entirely paper-free. • DIY paper management: Want to tackle your papers on your own but need some help? Check out our comprehensive guide on how to to file papers. We develop customized, simple systems that save you time and effort. • Time management: Master time management and gain control over your schedule, your calendar and your life! Get more done and have more time for fun! • Streamlining and automating routine tasks: Make routine tasks the no-brainers they should be. Easily manage the mail, pay bills, and deal with the realities of busy lives. Ensure that nothing “falls through the cracks”. • Sustainable systems that work for you: We develop simple systems based on your natural style and strengths to ensure that you will stay organized. Experiencing a change in your life? We’ll make sure your space and systems reflect your new needs and priorities. • Moving and relocation: Move without lifting a finger! We’ll help you with any – or all – aspects of a move, from creating a game plan to selecting a mover to unpacking and setting up your new home so you’re organized right from the start. Contact us to receive our free moving tips. Read more about our moving services. • Couples moving in together: We’ll help you merge and purge your possessions and create a home that works for both of you. • Newlyweds: Where will all those wedding gifts go? We’ll help you re-organize your space to make everything fit. Planning to wed? We can help you register for items that will truly enhance your new life together. • Making room for a new baby: Whatever the size of your current home, we’ll make room for your new addition. • Renovations: We’ll work with your designer or architect to plan storage and functional requirements of your new space. After the renovation we’ll unpack and set up everything so you can move right back in. • Preparing your home for sale: We’ll help you de-clutter and show off your home to help it sell fast for top dollar. • Downsizing: We’ll help you pare down your belongings and determine the best ways to sell, donate or give them away. • Estate clearance: We’ll work with you to pass on possessions, organize important documents, and clear out the home of your loved one. • And more! Have something else you need handled? Contact us – we love special projects! Whatever your situation, you may feel overwhelmed right now and crunched for time. You don’t have to handle this on your own. We can help! Working with Gotham Organizers is easy, fast — and even fun. Read client testimonials to see what other people just like you have to say about working with us and check out before and after photos of our projects. Email us or call (212) 866-9493 for a complimentary consultation to discuss your organizing challenges and how we can tackle them. We understand that there are many reasons that people need help getting organized. You may have tried to get organized many times. Or you may be someone who is actually very organized and even helps others with their organization projects. Or new situations in your life may require new organization systems. Here’s the thing: it can be tough and time-consuming to get organized on your own. The process can seem overwhelming, or you just may not have the time to get it done alone. Our proven Less Mess = Less Stress ™ process takes the guesswork out of getting organized and makes it easy, fast and even fun. For us, organization isn’t about alphabetizing your socks and wrapping your sheets in ribbon bows. It’s not about becoming a radical minimalist or tossing all your cherished mementos. It’s not about following rigid rules like “touch each piece of paper only once.” It’s not about being “perfectly organized” – an impossible goal. • It’s about being able to find what you need when you need it. • It’s about making the best use of your space. • It’s about feeling good in your place. • It’s about doing the things that need to be done, so you can have time for fun and the people and projects you are passionate about. We’ll help you get there, and stay there. We believe organization can help improve the quality of your life. We know that many people have struggled with organization, and we want to change that. It’s not something you need to be born with, like perfect pitch. With the right systems, a few key products and some good habits (alas, the mail won’t open itself), we believe that everyone can enjoy the benefits that organization brings. Think you may be ready to get started? Call (212) 866-9493 or email us for a complimentary consultation to discuss your situation and how we can help. Want to get a sense of how you’ll benefit from working with us? Read some client testimonials and check out before and after photos of our projects. Once we decide to work together, we come to your place and dive right in. There’s nothing you need to do ahead of time. It’s actually best if we see your place in its “natural state”. This gives us a sense of how you operate, so we can create systems that work with your natural tendencies. 1. We’ll discuss your goals and do a quick assessment of your space. Unlike some organizers, we don’t waste time creating a detailed plan that will make the process seem more complicated than necessary. 2. Together we decide where to start, based on what’s bothering you the most and where we can make key changes that will make the biggest difference quickly. 3. We roll up our sleeves and get right to work. We manage the process every step of the way. It’s our job to come up with solutions and recommendations. You simply answer questions about your goals and preferences, and we figure out how to get there. It goes more quickly when we work together, but if your time is limited, we can do a lot of work without you being present. We’ll move things around, probably let some things go, create systems, and amaze you with the difference you’ll see after your first 3-hour session. 4. As appropriate, we recommend organizing products, furniture and other resources to enhance your space and free up your time. 5. Voila! After a few hours, or a few days (or for really big projects, a few weeks) you’re done! Email or call (212) 866-9493 to discuss your situation free of charge to see how we can help. Get in touch – you’ll be happy you did.